Authorities say two thieves stole $1,000 from a group of Girl Scouts who were selling cookies at a New Jersey mall. Woodbridge Township police say the theft occurred between 4:20 p.m. and 4:50 p.m. Friday on the upper level of the Woodbridge Center mall. 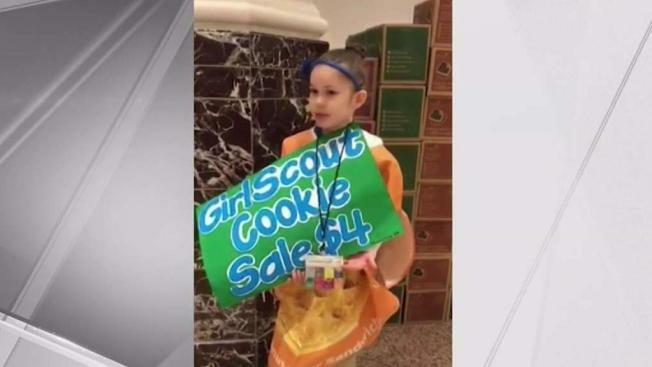 Two thieves stole more than $1,000 from a group of Girl Scouts who were selling cookies at a New Jersey mall, police said. Woodbridge Township police said the theft occurred between 4:20 p.m. and 4:50 p.m. Friday on the upper level of the Woodbridge Center mall. The money — about $500 in cash and several checks — had been placed in a bank envelope and left unattended on a table where members of Girl Scout Troop 80062 were making their sales. Mall surveillance cameras captured a man, who may have been in disguise, picking up the envelope and putting it in his pocket, authorities said. The man was with a woman using a red walker, and they left the mall shortly before the theft was discovered. "I think it's really wrong that somebody would steal from a bunch of Girl Scouts," one scout told News 4. The money stolen was going to fund a summer trip to the Girl Scouts headquarters in Savannah, Georgia. Despite the unfortunate experience, the scouts say they will keep selling cookies. "Because the objective of Girl Scouts is to stay positive and keep going even when things turn out wrong," the scout said.